Miner Campus Improvements - Coming in 2019! 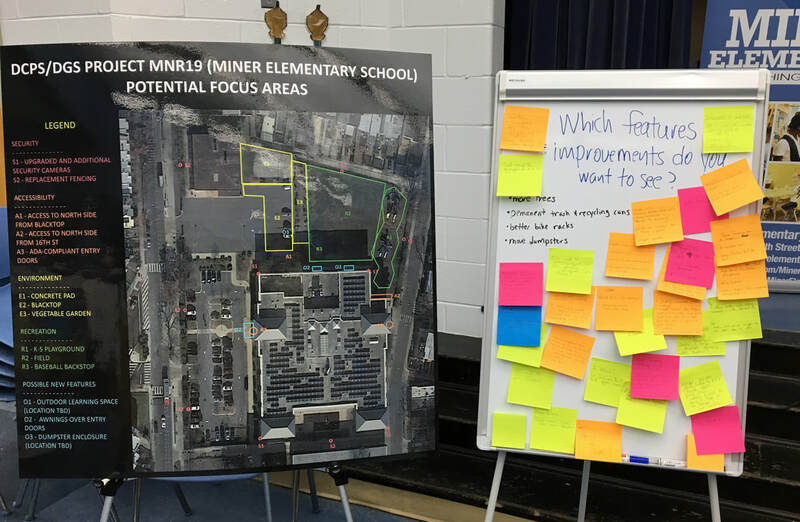 DCPS and the Miner community have officially kicked off the 2019 Master Site Planning process: a collaborative effort to plan the future of Miner’s outdoor campus and playgrounds, and then implement the changes we’d like to see happen for our students! The general timeline is to for DCPS to order equipment in January 2019 so construction can begin in March or April, with completion before school starts in August 2019. This fall and winter, DCPS will continue to hold monthly meetings open to the entire Miner community, including families, staff, and community members. These forums are a great opportunity to provide feedback and share your vision and ideas for what you’d like to see changed about Miner’s outdoor campus and playgrounds. Stay tuned for further details from the PTO about these meetings and how to participate. 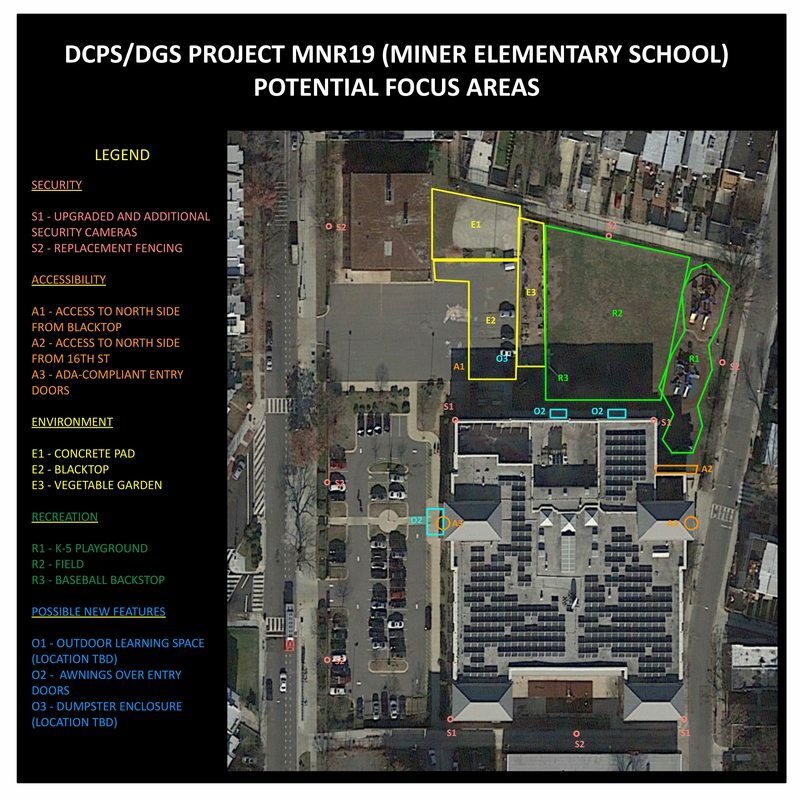 In addition to these public forums, Miner will establish a smaller "Master Site Planning Team" who will meet regularly with DCPS, the DC Department of General Services (DGS), site architects, and general contractors for detailed discussions and decision-making. This team will consist of 3 teachers, 3 parents, 1 student, 1 staff, and the custodial foreman. 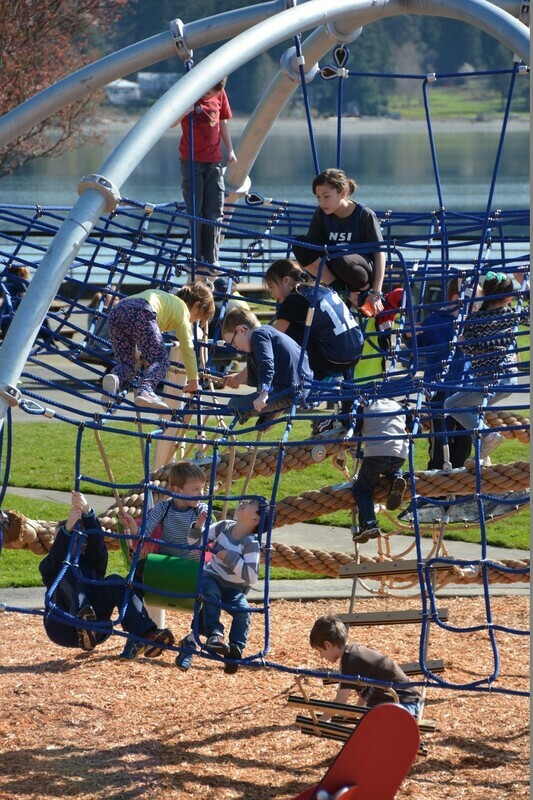 On March 4th, Sally Parker and Noah Pierce met with parents to share a number of options for the new K-5 playground using equipment from playground vendor Kompan. The proposed equipment was viewed favorably, and some proposed structures were discarded in favor of others. At the March 5th PTO meeting, PTO President Julie Muir presented a Special Topic on the results of the March 4th meeting and displayed a number of renderings and images of the proposed structures. See the images below, and the video to the right. Sally Parker of DCPS will give feedback to Kompan and they’ll prepare a revised concept. That document will serve as the basis of design that the winning contractor will use to solicit competitive bids from Kompan and at least two other vendors. General contractor bids were due March 4th and are currently being reviewed. Once awarded, the construction planning and estimating will really pick up. For the kickoff meeting, they will present all site info we’ve collected to date, including all site challenges, programming requirements, etc. 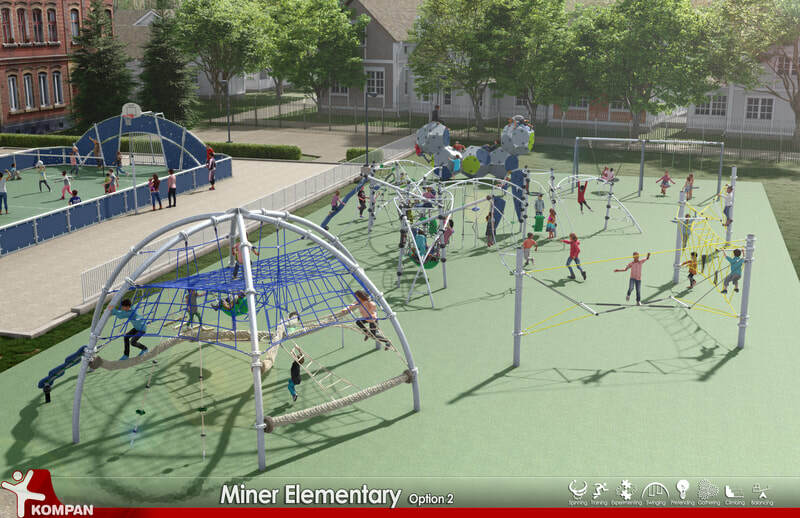 On Monday, March 4, Miner and DCPS will hold the next Master Site Plan Meeting, focused on the new K-5 playground. Sally Parker will bring design concepts from one vendor for us to review. 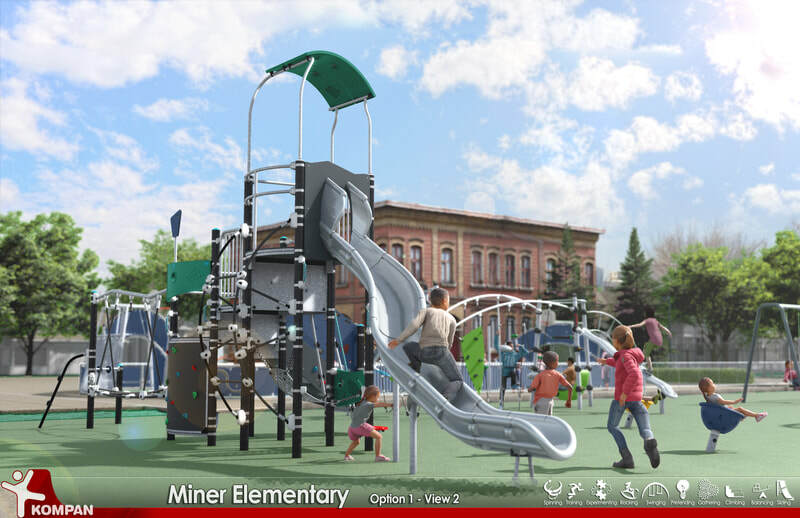 A general contractor will be on board soon and will use the playground concept we approve as the basis of design for bidding. Because we want as many families to have a voice in this project as possible, the meeting is scheduled from 4-6pm, but you can drop in at any time during that period to share your thoughts. Sally Parker from DCPS and Noah Pierce, the newly assigned DGS Project Manager, met with Miner administrators, staff, and parents to provide an update on the Master Site Plan process, and to present some general layout concept options. 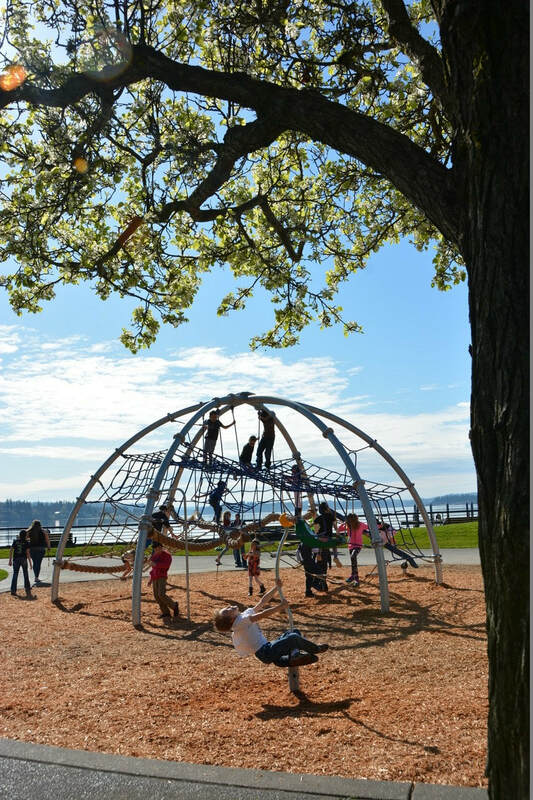 In general, it was felt that having the playground be centrally located, as well as adjacent to the school building would be best. That would alleviate the need to cross potentially wet or muddy turf to access the structures during recess. The eastern portion of the blacktop could also be utilized for features such as a garden, green space, or a "traffic garden" to teach bicycle safety. Enough room would be left in the existing turf area to keep the soccer field. Additional new features would include an outdoor classroom. 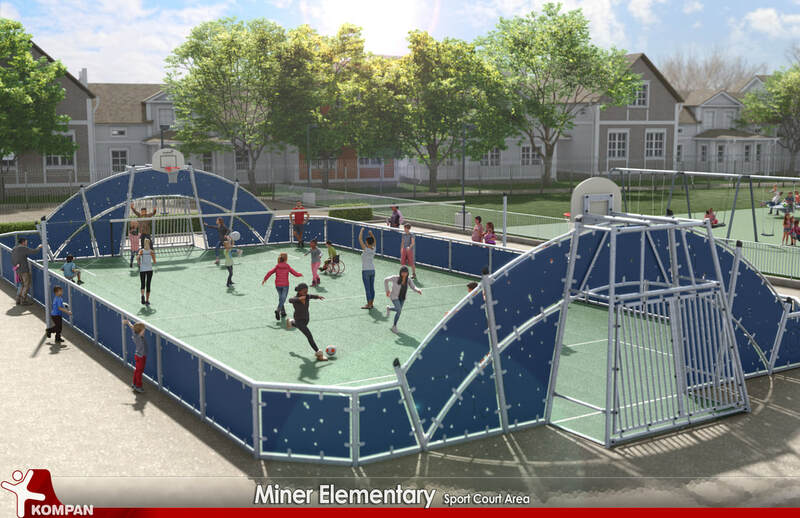 On Wednesday, December 12 from 4:30 PM - 5:30 PM, the Miner community will have the chance to meet with representatives from DCPS to discuss feedback collected so far, and next steps for the Master Site Planning process. Thanks to everyone who provided such great feedback - see the bottom of the page for a summary. The period for collecting comments has closed and we'll be providing the information to DCPS to develop some initial concepts for the site plan and the playground. At the October 2, 2018 PTO General Meeting, Principal Jackson presented background about the Master Site Plan process and conducted a feedback session with the parents and staff in attendance. A lot of great ideas were submitted, as can be seen in the photo below. After the meeting, the poster and whiteboard were set up in the east foyer so more parents could provide feedback. Ideas collected as of October 7, 2018 are summarized below the photo. The boards will remain set up until the first public forum, the date for which is still TBD.